Russia assists Assad offensive near Israeli border that US says violates ceasefire brokered by US and Russia. Russian jets attacked a rebel-held town in south-western Syria Sunday. The attack was the first recorded instance of Russian air-cover for the Syrian government's offensive to recapture land on the border with Jordan and the Israeli Golan Heights. Two tracking centers recorded at least twenty airstrikes on the city of Busra al Harir, two sources told Reuters. “We have tracked a sortie of 5 Russian jets that performed 25 raids,” said one source. According to the source, the aircraft had taken off from Russia’s Hmeimim air base in western Syria. 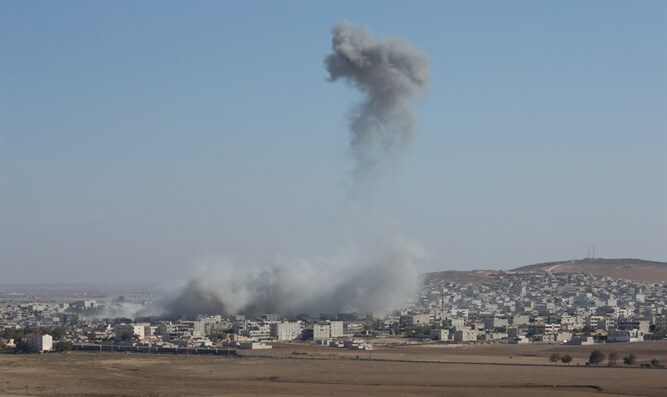 Government forces have been shelling the Free Syrian Army-held area with artillery and rockets. The Russian intervention marks a serious escalation in the assault. The area under attack was designated as a "de-escalation zone" under a cease-fire brokered by the US and Russia. On Friday, US Ambassador to the UN warned that Syrian President Bashar al-Assad's forces were “unambiguously violat[ing]” the ceasefire. The ambassador called on Russia to rein in Assad's forces and uphold the cease-fire.